Epson VS250 SVGA 3200 Lumens Color Brightness is currently selling at $299.99, approximately $0.43 higher than average. With a lowest price of $293.99 and an average of $299.56 it is selling on the high end of its usual range. Price volatility is 1.04% (meaning it does not change often), so you might have to wait a while for the price to drop. Right now this product is a recommended 'ok deal'. 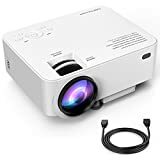 Compare the current price, savings (in dollars & percent) and Buy Ratings for the top Portable Projectors that are closely related to Epson VS250 SVGA 3200 Lumens Color Brightness. Here is how Epson VS250 SVGA 3200 Lumens Color Brightness compares with other leading Portable Projectors. Make a lasting impression with the VS250 portable projector, offering 3,200 lumens of color/white brightness (1) for vivid presentations - even in well-lit rooms. Featuring SVGA resolution (800 x 600), the VS250 is ideal for everyday projection needs. Its lightweight design and fast, easy setup tools get you up and running in no time. Plus, Epson 3LCD projectors deliver remarkable color accuracy, with up to 3x Higher Color Brightness (2) and up to 3x Wider Color Gamut (3) over competitive DLP projectors. The VS250 also supports HDMI, the standard in digital connectivity, for compatibility with the latest laptops and media players.1. Color brightness (color light output) and white brightness (white light output) will vary depending on usage conditions. Color light output measured in accordance with IDMS 15.4; white light output measured in accordance with ISO 21118.2. Color brightness (color light output) in brightest mode, measured by a third-party lab in accordance with IDMS 15.4. Color brightness will vary depending on usage conditions. Top-selling Epson 3LCD projectors versus top-selling 1-chip DLP projectors based on PMA Research sales data for Dec. 2015 through Nov. 2016.3. Gamut volume in brightest mode, measured by a third-party lab in 3D in the CIE Lab coordinate space. Top-selling Epson 3LCD projectors versus top-selling 1-chip DLP projectors based on PMA Research sales data for Dec. 2015 through Nov. 2016.4. Based on Ticino: U.S. Projector Brand Customer Perception and Preference Study, Multimedia Projectors 2017.5. For convenient and reasonable recycling options, visit our official site.6. Smart Way is an innovative partnership of the U.S. Environmental Protection Agency that reduces greenhouse gases and other air pollutants and improves fuel efficiency. 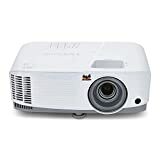 FeaturesMore accurate, vivid color, even in well-lit rooms - 3,200 lumens of equal color and white brightness (1).SVGA resolution (800 x 600) - ideal for projecting everyday presentations and graphics. Projected distance- 30 inch- 350 inch (0.88 - 10.44 m). PC and Mac compatibleF-number:1.44, focal length:16.7 mm, zoom ratio:digital zoom 1.0 - 1.35, pixel number:480,000 dots. Fast, easy setup with Epson - get up and running in no time with easy image adjustments and convenient control.Remarkable color accuracy - up to 3x Higher Color Brightness (2) and up to 3x Wider Color Gamut (3) with Epson over DLP projectors.